(*) The taxa 'Regnum' and 'Phylum' are in use, but not covered by the Rules of Bacteriologocal Code (1990 Revision) (sources: NCBI, Bacterio.net). 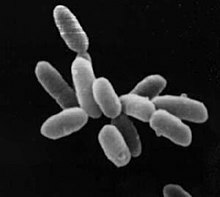 The category 'Candidatus' is not covered by the Rules of Bacteriologocal Code (1990 Revision). A name included in the category Candidatus cannot be validly published, and it also cannot be designated sp. nov., gen. nov., etc. (source: Bacterio.net). Woese, C., Kandler, O., & Wheelis, M. 1990. Towards a natural system of organisms: proposal for the domains Archaea, Bacteria, and Eucarya. Proc. Natl. Acad. Sci. U.S.A. 87 (12): 4576–4579. PMID 2112744 . Becerra, A., Delaye, L., Islas, S., & Lazcano, A. 2007. The very early stages of biological evolution and the nature of the last common ancestor of the three major cell domains. Annual Review of Ecology, Evolution, and Systematics 38: 361–379. Brochier-Armanet, C., Boussau, B., Gribaldo, S., & Forterre, P. 2008. Mesophilic Crenarchaeota: proposal for a third archaeal phylum, the Thaumarchaeota. Nature reviews microbiology 6: 245–252. For more multimedia, look at Archaea on Wikimedia Commons.